﻿ The Billion Dollar Question: What is a Billion? Home Tips & Tricks The Billion Dollar Question: What is a Billion? 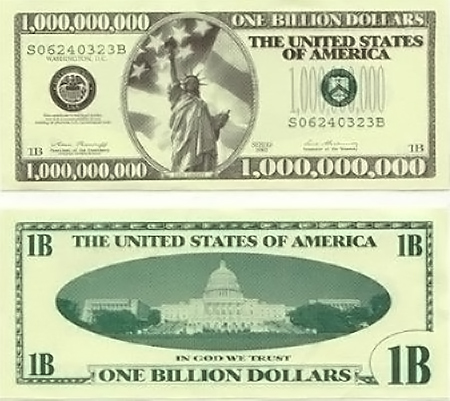 17 Jan 2013 Print The Billion Dollar Question: What is a Billion? A reporter once decided to interview God. Reporter: What are a billion years to you? Reporter: What are a billion dollars for you? Reporter: Well, then can you give me a penny? God: Sure, just wait a second! What is a billion? How many zeroes are there in a billion? This is a perennial problem that crops up in all walks of life but is seldom serious enough to be called a problem. I nevertheless thought I’d just pen a few words here to lay the matter to rest. The trouble here is that some countries have adopted what is sometimes called a ‘short scale’ billion which is a thousand times a million or 109 in size. At the same time, other countries have adopted a ‘long scale’ billion which is a million times a million or 1012 in size. Most English-speaking countries tend to use the short scale billion and most of Europe tends to use the long scale billion. Britain used to be in line with Europe but officially changed to the short scale billion in the 1970s. If we’re looking for someone to blame for the confusion then we should gang up on our French friends as they are responsible, apparently, for developing both systems. Is that really a billion-dollar problem? In the numerical reasoning questions it doesn’t necessarily cause a problem. For example, suppose we have a question which states that the GDP of a country is €127bn and it rises by 12% over 4 years. What will its GDP be in 4 years’ time? The answer turns out to be €142bn whichever definition of a billion you choose to use provided you use and stick to one definition. This is because the answer is in the same units as the provided data. However, there can be a small issue if the example is just slightly different. Now we have problem because the definition of a billion will directly affect the answer. It is fair to say that, in general, where the answer relies on the definition of a billion we do try to specify which definition we are using somewhere in the question itself. I know that some have been missed and we are currently reviewing all the questions to ensure there is no ambiguity or unfairness to anyone who lives in a country which uses the ‘other’ billion from that of the person who set the question. In the meantime though, if you come across a question that is dependent on the definition of the billion and there is no indication given, then it is probably safe to assume that the short scale billion has been used. Uncertain about the best methodology to prepare for your numerical reasoning test?